String of Pearls, 2016. Twelve-color lithograph, 35 x 27 inches. Collaborating Printer: Valpuri Remling. Edition of 18. 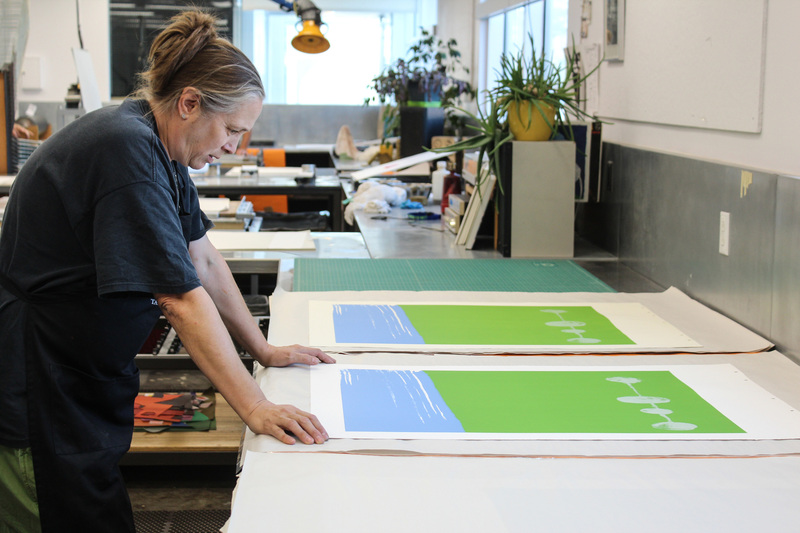 For her first artist residency at Tamarind, Heidi Pollard arrived with a box of painted color samples and a book with hundreds of small drawings in ink and gouache. Her work as a painter is guided by her inherent sense of color and rooted in her practice of drawing, and this is how she approached the new medium. 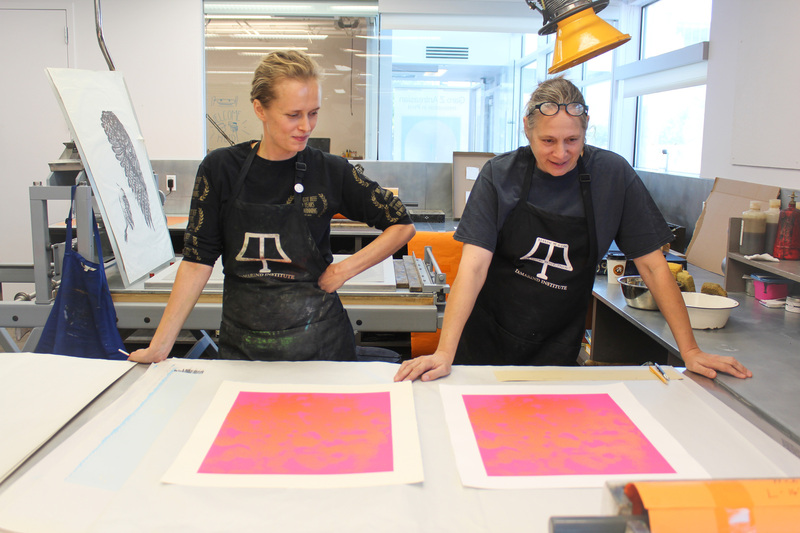 Throughout the residency she experimented with multiple drawing tools and color variations, working on stone and with aluminum plates before honing in on the pure line and layering of color that are central to lithography. Slot Machine 1, 2016. Four-color lithograph, 15 x 15 inches. Collaborating Printer: Ash Armenta. Edition of 10. Slot Machine 2, 2016. Four-color lithograph, 15 x 15 inches. Slot Machine 3, 2016. Four-color lithograph, 15 x 15 inches. She created a series of three related prints, Slot Machine 1-3, and a larger print, String of Pearls. The Slot Machine series, with the fluid line and endearing forms of her emblematic drawing style, brings her unique visual vocabulary to the front in pure black. The animated forms are organized in a grid and layered on to a deceptively simple ground of creamy white and green grey inks. The String of Pearls print, developed in collaboration with Tamarind Master Printer Valpuri Remling, is constructed around solid color blocks, with a zip of orange along the top edge that innervates the whole composition. The grid appears here too, in loose hand-drawn lines printed in black that brings ballast to the vibrant color, and a base for the suspended line of airy white ovals. Pollard is the recipient of a Joan Mitchell Foundation grant for painters and sculptors, a Roswell Artist in Residence Program fellowship, and a Pollock-Krasner Foundation grant. She lives and works in Albuquerque, New Mexico. in the Tamarind workshop, 2016. Artist Heidi Pollard in Tamarind workshop, 2016. 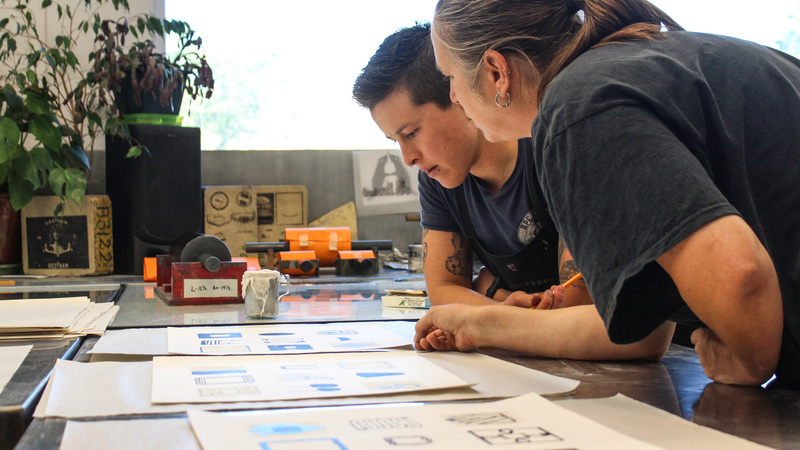 Apprentice printer Ash Armenta with artist Heidi Pollard in the Tamarind workshop, 2016.
or contact us at 505.277.3901, tamarind@unm.edu.